This is the online version of the Open Access book: Predictive Soil Mapping with R. Pull requests and general comments are welcome. These materials are based on technical tutorials initially developed by the ISRIC’s Global Soil Information Facilities (GSIF) development team over the period 2014–2017. This book is continuously updated. For news and updates please refer to the github issues. Hard copies of this book can be ordered from www.lulu.com. By purchasing a hard copy of this book from Lulu you donate $12 to the OpenGeoHub foundation. Hengl, T., MacMillan, R.A., (2019). Predictive Soil Mapping with R. OpenGeoHub foundation, Wageningen, the Netherlands, 370 pages, www.soilmapper.org, ISBN: 978-0-359-30635-0. Tom Hengl is a Senior Researcher and Vice Chair of the OpenGeoHub Foundation / technical director at Envirometrix Ltd. Tom has more than 20 years of experience as an environmental modeler, data scientist and spatial analyst. He is a passionate advocate for, and supporter of, open data, reproducible science and career development for young scientists. He designed and implemented the global SoilGrids data set, partially in response to other well known open data projects such as OpenStreetMap, GBIF, GlobalForestWatch and global climate mapping projects. He has taught predictive soil mapping at Wageningen University / ISRIC within the “Hands-on-GSIF” block courses. 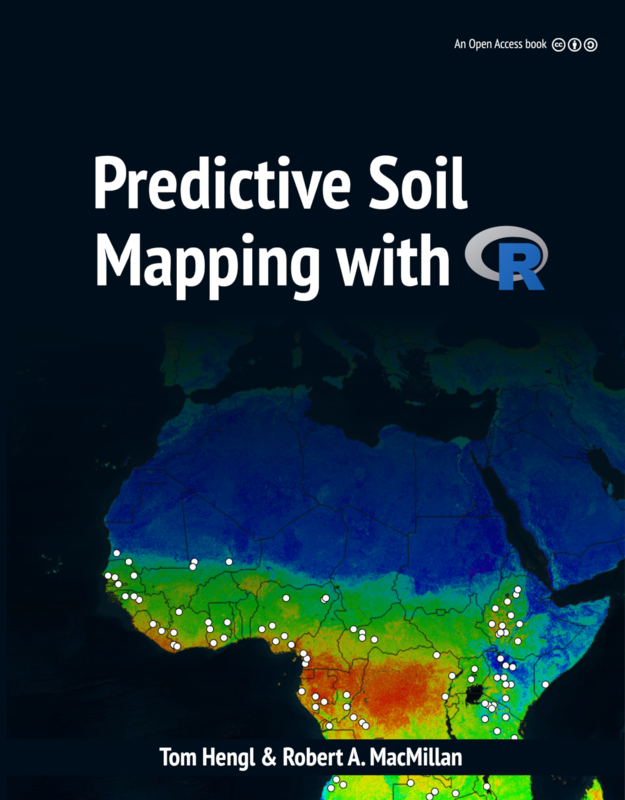 Video tutorials on predictive soil mapping with R can also be found at http://youtube.com/c/ISRICorg and https://www.youtube.com/c/OpenGeoHubFoundation. Tom currently leads the production of a web mapping system called “LandGIS” (https://landgis.opengeohub.org) which is envisaged as “an OpenStreetMap-type system” for land-related environmental data. The system hosts global, fine spatial resolution data (250 m to 1 km) including various soil classes and soil properties, which is intended for eventual integration and use at operational or farm-scales. Bob MacMillan is a retired environmental consultant with over 40 years of experience in creating, packaging, delivering and using environmental information on soils, ecosystems, landforms and hydrology. Bob spent 19 years working in public sector research with the Alberta Research Council and Agriculture and Agri-Food Canada and a second 20 years as a private sector consultant offering services in predictive soil and ecological mapping. Since retiring, Bob has remained an active supporter, promoter, advocate, mentor and technical contributor to several continental to global scale efforts to advance the science and technology of mapping soils and other ecosystem components. As Science Coordinator for the GlobalSoilMap project, Bob helped to articulate the vision for the project and led initial activities aimed at achieving this, including authoring technical specifications, promoting the project, recruiting participants/cooperators, and liaising with representatives of national and international soil agencies. Bob continues to contribute on a voluntary basis to OpenGeoHub and the Africa Soil Information Servicce (AfSIS) (http://africasoils.net). Throughout his career, Bob has shared his expertise and his enthusiasm freely with dozens of younger scientists interested in learning about, and becoming, practitioners of digital soil mapping. Bob continues to support the next generation of digital soil mappers through his involvement with OpenGeoHub.